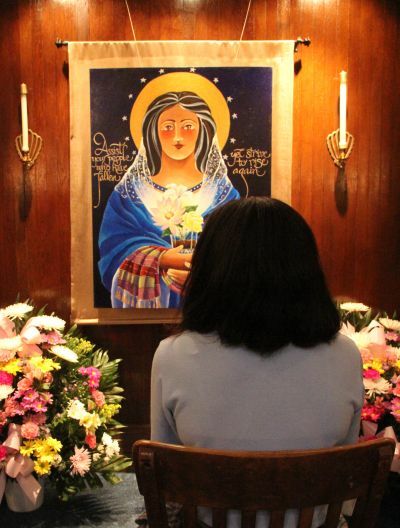 A visitor prays before the shrine to Our Lady of Light, featuring a painting by Brother Mickey McGrath, at BVM Church in Darby. Just about every Catholic Church has at least one and often several images of the Blessed Virgin for the edification of the faithful, and that is certainly the case at Blessed Virgin Mary, Darby. It is an old church, built in 1930, but one shrine to the Blessed Virgin is new. 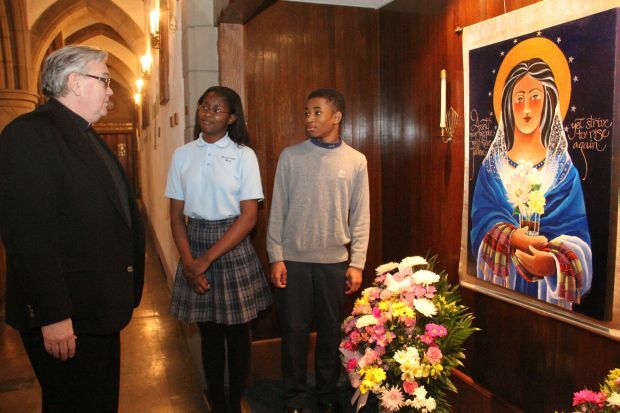 It was installed just last October and is unique among the archdiocese’s 235 parishes. 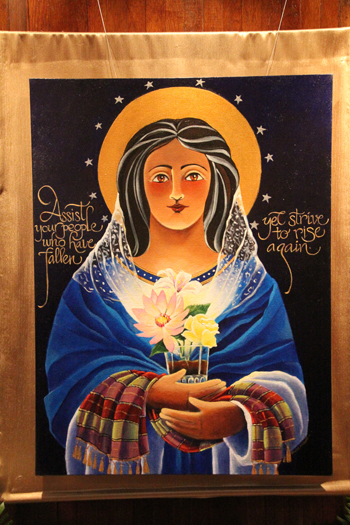 In the icon, Mary is depicted holding a broken cocktail glass, and growing from it are three flowers: a lotus symbolizing enlightenment and beauty; a golden rose symbolizing the rosary, especially the mysteries of light; and a lily, reminding everyone of the hope of Easter and the promise of a new beginning. The shrine, which has two chairs in front of it for meditation, was the idea of Father Joseph Corley, who has been BVM’s pastor for the past 15 years. During that time, he has had to preside at the funerals of too many people who died as a result of addiction. Substance abuse is probably no worse at BVM than in most other parishes – maybe eight percent of the deaths over the years, as a ball park figure. What really bothers Father Corley is that most of them are way too young to die – they’re often between 20 and 45. For some it’s a slow death after alcohol has destroyed their system, for others the instant death of drug overdose. At BVM the deaths are about evenly divided between men and women and usually members of families Father Corley sees every week. “We try to support the parents,” he said. This isn’t a brand new experience for Father Corley. “I was a detox counselor at a VA hospital earlier in my career,” he said. It’s encouraging to him when he sees members of the parish, or people from other parishes, who attend one of the two Alcoholics Anonymous groups that meet at BVM or family members who attend the Alanon groups in the parish. Some of those who enter recovery programs for addictions do not speak about it outside of their 12 step group. Others might find talking about the issue therapeutic and a way to encourage others to join. Richard Whalen, 37, an active member and lector at BVM, is a recovering alcoholic who belongs to the latter group and is quite open about his own struggle. Growing up the son of an alcoholic parent, he swore to himself he would never drink. That changed when he was 21 and he not only drank but before long drank constantly. It didn’t stop after he married. Although his wife, Lee Anne, often threatened to leave him because of his alcoholism, he is thankful she stuck by him. “She has been so supportive and has helped me along the way,” he said. Through it all, there was his Catholic faith, which included daily rosary and prayers even though he refused to admit he had a problem. It was back in 2008 that he finally got up the courage to do something about it. He emailed Father Corley and told him he had a “little” drinking problem. Father Corley was more than helpful, and convinced him to join an AA group, and he has been a steady member of the Wednesday night group ever since. Were there any relapses? Yes, a very brief one in 2013. But that’s why AA members call themselves “recovering alcoholics,” not “recovered alcoholics.” It is a lifetime commitment to the program. Meanwhile Whalen has the support of his friends and family, along with Father Corley. And of course, there is the Shrine to Our Lady of Light, Help of the Addicted. “I love the shrine, I go there often,” Whalen said.